Wide-ranging travel has always been part of the WCTU’s history (think of Frances Willard’s speaking tours, and of the WCTU organizers who collected 7.5 million signatures on the Polyglot Petition in the 1880s). Imagine the warm welcome those women received when they got back home to Evanston! 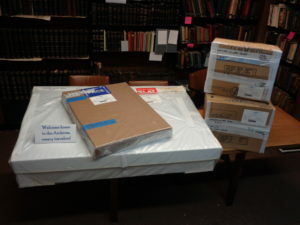 These thoughts came to mind on July 26 when a group of WCTU documents and artifacts, on loan to the National Constitution Center (NCC) in Philadelphia, was returned to the Willard Archives after a 6-year, 11-museum grand tour of the US. 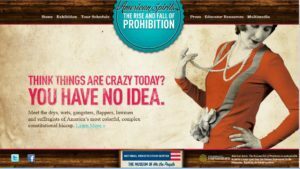 Although the exhibit and its promotional material featured some of the sensationalized elements of the Prohibition era—flappers, bootleggers, etc.—it also drew serious attention to the temperance movement and the work of the WCTU. Originally slated for installation in seven museums (in St. Paul, St. Louis, Indianapolis, Seattle, Grand Rapids, Austin, Omaha), the “American Spirits” tour was extended twice, playing in Peoria and Pittsburgh before disbanding for good in June, 2018. Now, as we unpack the shipment, glad as we are to replace the well-traveled items in their familiar archival boxes, we are grateful to our museum colleagues around the country who hosted the exhibit and handled our items with scrupulous care, and to the NCC for giving the Willard Archives the opportunity to share some of our treasures with a far-flung audience. 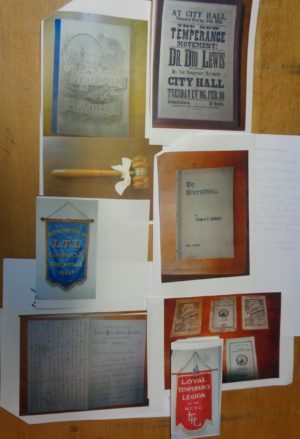 Sneak preview: a streamlined version of the “American Spirits” exhibit will be opening at the Evanston History Center in 2019 to commemorate the ratification of the 18th amendment…. details later….